In Iran, before the second ruku in prayer, what is said during the standing dua? I experienced this repeatedly here in Iran, so I suspect this is a Shia thing. In prayer, during the second rakat just before ruku, we make dua while standing. I'm wondering what people are saying during this dua. 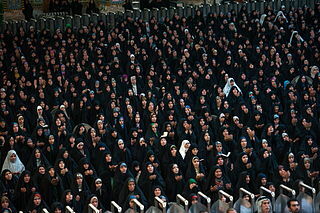 Question: In Iran, before the second ruku in prayer, what is said during the standing dua? Wikipedia mentions that dua is particularly important in Shia Islam, and even has a photo of women performing (what I would guess is) this particular dua. It's not mandatory. You can just move on and not do it all. But It's recommended. It's the moment where you ask Allah anything and everything. "O Allah! Give to us in the world that which is good and in the Hereafter that which is good, and save us from the torment of the Fire." or to simply recite a dua faraj* for Imam Mahdi as his ease would be the greatest ease for mankind! O Allah, be, for Your representative, the Hujjat (proof), son of Al­Hassan, Your blessings be on him and his forefathers, in this hour and in every hour, a guardian, a protector, a leader, a helper, a proof, and an eye. until You make him live on the earth, in obedience (to You), and cause him to live in it for a long time. O Allah, grant forgiveness to me for my sins and the sins of my parents, and mercy on both of them as he both took care of me when I was little, so are all Muslims and muslimat, all believers, male and women who are still alive or already dead, and ikutkanlah between us and them with kindness. O Allah, grant forgiveness and mercy of God be merciful because You are more compassionate and no power and effort but with your help. But other than recommendations you can ask Allah to make you rich, heal the sick, bless the hearts of the Muslims, feed the hunger, etc. From WikiPedia: According to the Hanafi opinion, one is supposed to give Takbir (Say Allahu Akbar and raise his palms till ear lobes and hold them back below or above navel with right hand over left) before going into Ruku in 3rd Rakah and recite the Following Qunut Prayer also called as Dua-e-Qunoot (Prayer of Qunoot). After reciting the Dua, Muslims then bend in ruku and perform the rest of the Salath. Faraj فرج means ease, easement, hast so that our awaiting for Imam Mahdi would be reduced. RABBANAAA AATINAA FIDDUNYAA H’ASANATAW WA FIL AAKHIRATI H’ASANATAW WA QINAA A’D’AABAN NAAR (AL BAQARAH: 201) Our Lord, give us good in this world, and good in the hereafter, and save us from the torment of fire. Not the answer you're looking for? Browse other questions tagged salat shiism dua or ask your own question. What is the source of this dua read in Witr prayer? What were the obligations of prayer before Hijra? What is Dua Qunut and when should we recite it in the Prayer/Salat? What do you say during the final Tashahhud, and when standing up from Rukuu'? How am I supposed to pray when I'm having terrible headaches? Is it fard to recite dua masura before finishing the prayer? When exactly do you say “allahu akbar” during salah?